Airworks was honoured to be asked to send Darryl Weflen to represent on this prestigious panel. From self-sufficient green homes and state-of-the-art power generation, to world renowned gaming experiences and air compression inventions: the participants in the Edmonton Chamber Pioneering Innovation. 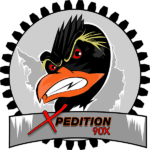 Our President, Darryl Weflen, had the opportunity to share the vision for Xpedition 90X, a ‘trip of firsts’ spearheaded by Airworks Compressors to prove the ruggedness of the newly developed G-Force Hybrid Drive System in the most harsh environment on earth. Panel represent Edmonton companies at the very forefront of product, science and technology innovation.